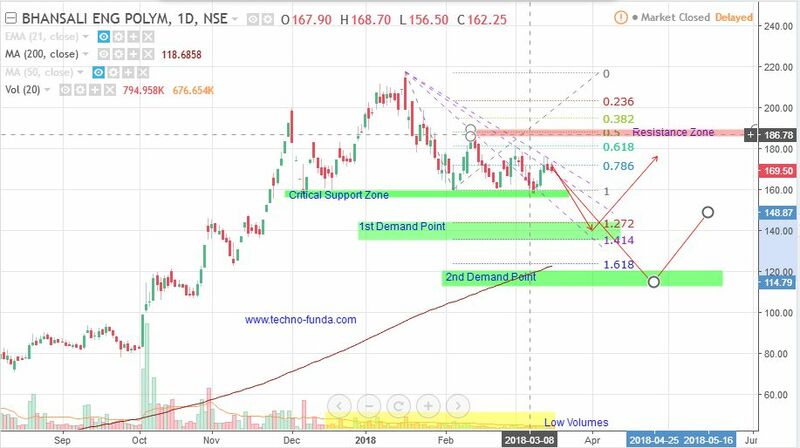 BEPL looking like in Consolidating and Forming the "Descending triangle" pattern on day charts. Price got rejected from 50% levels recently and moving side ways with lower highs. Although its making strong support at 155 - 160 levels, but looking at overall trend and nifty , price likely to break the support. This confirms the bearishness and "Descending triangle" pattern breakout. The first demand point will be 135-140 where we can expect minor retracement. If price fails to hold above level, we can see 110-120 levels, which happens to be Major demand point and we can expect price reversals strongly. Investors are advised to Use "Buy in Parts - Buy in Dips" strategy until they see a clear hold of mentioned levels.